Very few know that at the end of a long tiresome working day, the country’s former Prime Minister Lal Bahadur Shastri would turn to his wife Lalita to listen to her bhajans every evening. Among the many bhajans that he thoroughly enjoyed was “Bhole Bhole Rat Te Ho Gayi Main Baanwaria”, one of Lalita’s favourite compositions. Bringing the magic of her songs on stage was their daughter-in-law Meera, at Epicentre in Gurgaon on Saturday evening. 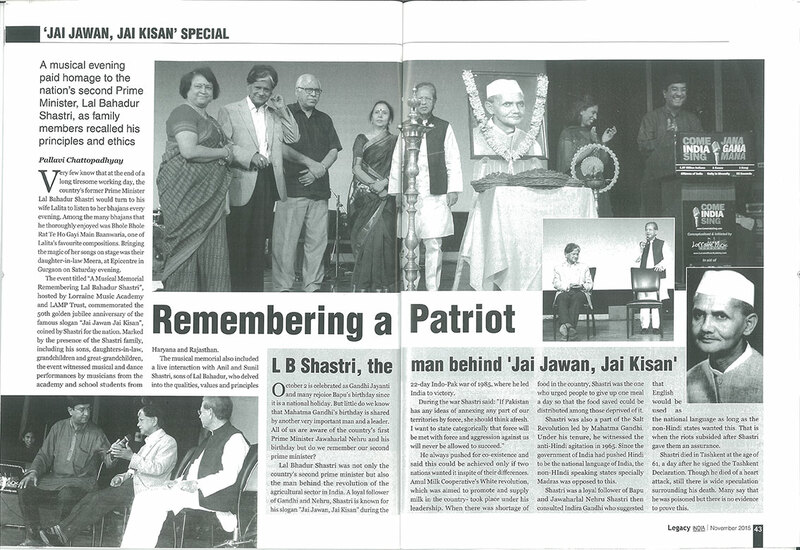 The event titled “A Musical Memorial Remembering Lal Bahadur Shastri”, hosted by Lorraine Music Academy and LAMP Trust, commemorated the 50th golden jubilee anniversary of the famous slogan “Jai Jawan Jai Kisan”, coined by Shastri for the nation. Marked by the presence of the Shastri family, including his sons, daughters-in-law, grandchildren and great-grandchildren, the event witnessed musical and dance performances by musicians from the academy and school students from Haryana and Rajasthan. The musical memorial also included a live interaction with Anil and Sunil Shastri, sons of Lal Bahadur, who delved into the qualities, values and principles of the leader. Anil said, “The slogan ‘Jai Jawan Jai Kisan’ symbolises self-reliance. During the Indo-Pak war, the American President threatened him, saying that if he did not stop the war, they would stop the export of wheat to the country. Of the many qualities and values that Lal Bahadur possessed, Anil dwelled on his father’s honesty, integrity and humility. He said, “When I was 17, I had just learnt driving and asked his secretary to help make a driving license. I showed it to my father later. He asked me how could I own it since I was not 18 yet. I replied saying, ‘Because I am the PM’s son’. He was sad and hurt because the law of the land had been violated in his own house. This programme is to inculcate in today’s youth what these great leaders have taught us.” The event concluded with the national anthem being sung by everyone present in the auditorium in exactly 52 seconds, its official duration. Copyright © 2013-2019 | Come India Sing | A Nation Building Project | Conceptualised, Initiated & Implemented by: LAMP Trust | Aided by: Lorraine Music Academy Pvt. Ltd. | All rights reserved.